[AUTO](Soul):[Soul Blast (1)] At the beginning of your main phase, if you have a «Pale Moon» vanguard, you may pay the cost. If you do, call this card to (RC). [AUTO](RC):At the beginning of your end phase, if you have a «Pale Moon» vanguard, put this unit into your soul. ...when I first saw this card, I actually thought it was pretty decent...until I actually played it and realized how much of a liability this card ends up becoming. Peek-a-boo is an abyssmal 8,000 Power and doesn't even stay around to be used as an interceptor as it hides into the Soul at the end of the turn. What's worse is that if you want him back out (which you shouldn't unless you're that deperate), you have to Soulblast a card to bring it out! Normally, this wouldn't be a bad thing, but Pale Moon rely on their Soul so badly that even losing a single card from it can upset the rest of the game, and having this card, literally, eat your Soul from the inside is just not right. Any other Clan, I'd probably be okay with this, but for Pale Moon, this is definitely the worst choice. Next Time: Playing teacher for Futurecard Buddyfight! Closing what was probably going to be Pale Moon Week (before Cable Sheep got all up in our grill) we close with Pikachu - sorry, Peek-a-BOO. At any time during your main Phase, you can Soulblast 1 card and call him out from your soul until the end of turn. This makes this guy highly abuse-able with Purple Trapezist, since he would retreat back at the end of the turn anyway. You can effectively turn him into a +1 for 1 soul, all for free. He can also cover for your attackers (as long as you have a strong booster to cover for his abysmal power such as an emerged Jumping Glenn or Turquoise Beast Tamer) until you get something better. However, do make sure you actually have something you want to lose from the soul before you use this guy. A deck that Soulcharges a lot for something such as Luquier or Mistress Hurricane will most likely have some junk they don't mind Soul Blasting. Failing that, Purple Trapezist can generate junk to Soul Blast for him with her own skill. He just sits there, not bothering anyone, until you ask him. That's why I like him. Obviously don't run any more than 2 of him at max, but with Dancing Princess of the Night Sky to search him, he is a really nice option to have. Peek-a-boo…I’m sure there’s a pun in there somewhere…but today we have yet another performer for the Pale Moon Circus. A very fascinating for a robot clown indeed. Personally I think he should have been a magician. So the name does make sense. Being a grade 2 he can pop in during your turn for support and then pull a Houdini to survive so you can attack again next turn. His attack is low but he makes up for it with a very surprising trick. Now should he be in your deck? That’s a very hard trick to swallow. 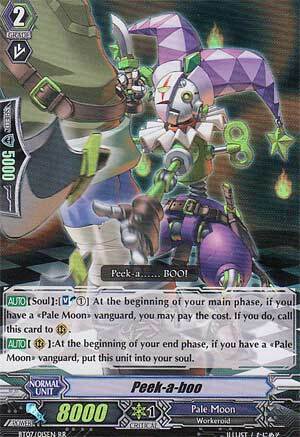 On the one hand if you know pale moon and you can judge just how fast you fill up the soul to make sure you can have the power to pay for -2 cards from the soul just so he can make an appearance….I’d say go ahead and try him out, play test the clown certainly. Although if you suffer from Coulrophobia, it might be unwise. All in all the sad clown deserves a 4/5 in the right deck. 1/5 if you still have nightmares about Tim Curry and giant spiders.